Cast: Kim Myung Min, Choi Jae Sung, Lee Jae Ryung, Choi Chul Ho and many others.. 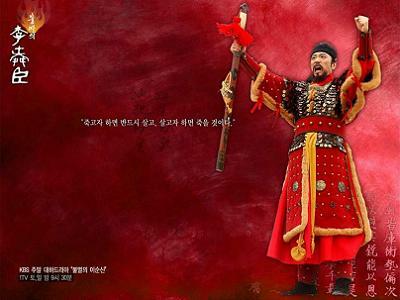 This drama is the biopic of the great admiral Yi Soon Shin, from his childhood till his death. Yi Soon Shin (Kim Myung Min) was born as a poor noble, due to his grandfather being convicted as a traitor, which leads to his family being labelled for generations. Being book-smart and intelligent, Soon Shin has together with his two best friends Won Kyun (Choi Jae Sung) and Yoo Sung Ryung (Lee Jae Ryung) made a promise to apply for scholar positions at Sunkyungkwan, but due to the lack wealth and reputation, he decides to change paths, and becomes a soldier. This is another one of the most popular heroes of Korean history, and probably one of the most liked one too. The best part for me was that it almost fit the ‘real’ story perfectly (almost), but another good part is that it was very exciting to watch - there were things happening quite often. There was storytelling, but not in the boring kind of way. That said, 104 episodes is a lot! Even if you love every character and love the story, it seriously is long. Even if you binge it, it takes a lot of time. I remember when I was at the last episode and they showed the entire storyline, it seriously felt like it was years ago. And I do think it took me a week or so… and I was binging… The casting was perfect: Kim Myung Min is great as Yi Soon Shin, and his voice just fits like a glove. The bad part is though the makeup and wigs/fake beards… It really looked fake. Also the ‘wars’ looked very cheap - I don’t know if it because its from 2004, but you could see that some scenes were used more than once, and the “turtle ship” was also filmed from different angles, so you would think there were more than one. Besides that (actually not something I spend much time thinking about), it was a really good watch.